The raw mango is generally green in color and is highly appreciated for its nutritional value. Following are some useful and natural benefits of Kairi/Unripe Mango. This week the team of Social Diary brings you a quick and easy recipe which you can make at home and get the benefits of Kairi… so here you go, try and enjoy it…!!! 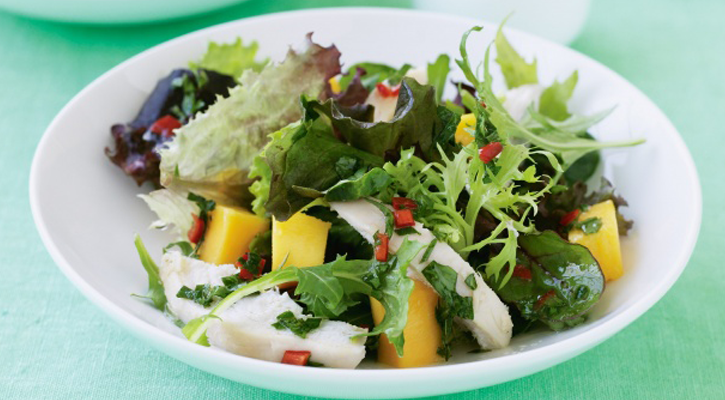 The sour and sweet taste of unripe mango plays with the succulent chicken to create a winning salad meal. Step 1: Combine oil, 2 tablespoons lemon juice, parsley and chilli in a small bowl. Step 2: Combine chicken, mango and salad greens in a large bowl. Drizzle over chilli dressing. Toss lightly to combine. Serve and enjoy..!!! Previous Post8 Foods that make your skin age faster Next PostBenefits + Recipe = Reasons to eat LOQUAT this summer..! !